It’s tomato-planting time again! If you’ve grown tomatoes in the past, you most likely have your favorites. If not, just ask! You’ll find some pretty strong opinions regarding tomato choices, and every gardener has their own top choices, must haves and great picks for tomatoes. 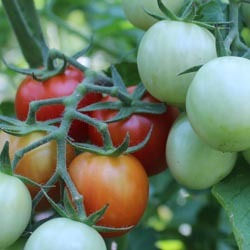 Along with soil type, climate, moisture and other typical gardening considerations, one of the features you will need to take into account when choosing what type of tomato to grow is plant habit. The two main habit classifications are “determinate” and “indeterminate” and are based on fruit use, available growing space and length of growing season. Both habit classifications include fruit selections in a wide variety of colors, sizes, shapes and tastes. By understanding the differences between these basic tomato classifications, it will be easy for you to choose the tastiest tomato to suit your gardening needs and harvest preferences. Many gardeners choose more than one of each type of tomato, ensuring there is always a bountiful supply to use, to share and to enjoy!